T.A. Frank, in Vanity Fair, totally demolishes the third member of the Clinton Dynasty. Like tribesmen laying out a sacrifice to placate King Kong, news outlets continue to make offerings to the Clinton gods. In The New York Times alone, Chelsea has starred in multiple features over the past few months: for her tweeting (it’s become “feisty”), for her upcoming book (to be titled She Persisted), and her reading habits (she says she has an “embarrassingly large” collection of books on her Kindle). With Chelsea’s 2015 book, It’s Your World, now out in paperback, the puff pieces in other outlets—Elle, People, etc.—are too numerous to count. Perhaps the best way to start is by revisiting some of Chelsea’s major post-2008 forays into the public eye. Starting in 2012, she began to allow glossy magazines to profile her, and she picked up speed in the years that followed. The results were all friendly in aim, and yet the picture that kept emerging from the growing pile of Chelsea quotations was that of a person accustomed to courtiers nodding their heads raptly. Here are Chelsea’s thoughts on returning to red meat in her diet: “I’m a big believer in listening to my body’s cravings.” On her time in the “fiercely meritocratic” workplace of Wall Street: “I was curious if I could care about [money] on some fundamental level, and I couldn’t.” On her precocity: “They told me that my father had learned to read when he was three. So, of course, I thought I had to too. The first thing I learned to read was the newspaper.” Take that, Click, Clack, Moo. Sounds perfect for a dating profile: I speak at length, and you really need to let me finish. I’m not used to interruptions. 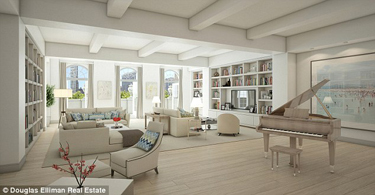 Combined living-dining room of Chelsea Clinton’s block-long, Gramercy Park apartment. Chelsea Clinton, who got paid $26,000 a minute by NBC, recently informed America that she doesn’t really care about money. Which posturing not surprisingly provoked Elizabeth Scalia (“The Anchoress”) to put the spoiled young woman firmly in her place. Do not follow in your parent’s footsteps and try to convince the world that money means nothing to you. Money never means “nothing” to the people who cannot stop talking about it, and between your poor “not truly well off” mother, and your dad who is forever telling us that he’s happy to be a rich guy paying rich guy taxes, and now this…just stop it. You tried really hard to care about money? And naturally you couldn’t because no good or noble person actually does that? Naturally, only greedy, vulgar people would care about money. I wonder who they might be? And do they know how offensive they are? Perhaps on your way to the Hamptons this summer you can lean out — but not if you’re taking a chopper, of course — and hear the family that will be stay-cationing it for the fourth year in a row, because the “recovery summer” hasn’t reached them yet. You should be able to hear them, because the grumbling is getting pretty loud in those neighborhoods. When you mewl in blissful ignorance about trying “really hard to care about money” all you do is emphasize that money worries are a non-issue for you. You insult every man and woman who are forced to “care about money” as they struggle to pay their bills and sacrifice so their kids can join a baseball league or take a dance class (like you did); you diss everyone who is forced to “care about money” because they haven’t had a raise in a couple of years, though costs keep rising — or because they are retired and aren’t seeing the interest income they’d planned on, and so the house is falling into disrepair, and they can’t sell it because young couples weighed down with student loans aren’t buying those fixer-uppers the way they used to. No one minds your being rich, but have a little class about it. Don’t sit in your ivory tower — justifiably excited to be expecting the best-connected-baby in the world, with access to the finest doctors and no worries about what sort of school environment or teachers your child will have to endure — and suggest that none of it matters, as though you’d be just as happy living in a garage apartment next to 7-11 and with no immediate plans to board a private jet. [W]ith all due respect, lady, gain some self-awareness; understand what has been handed to you through very little effort of your own. Before you talk about how much you can’t bring yourself to care about money, why don’t you…check your extraordinary .0000001% of the .0001% privilege. 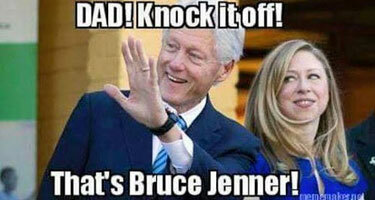 Chelsea Clinton recently lamented her great grandmother having no opportunity to terminate the unplanned pregnancy leading to her grandmother’s birth. 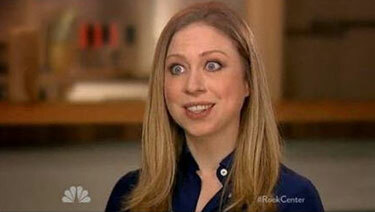 the Archives of Never Yet Melted in the 'Chelsea Clinton' Category.